Flexible, high-density I/O in the XMC730 solves a variety of SWaP-challenges, claims Acromag. The company has introduced an XMC version of the PMC730 multi-function I/O module. It performs analogue input, analogue output, digital I/O and counter/timer functions. Three models provide front 68-pin SCSI-2 I/O connection or rear P16 and P4 I/O connectors. 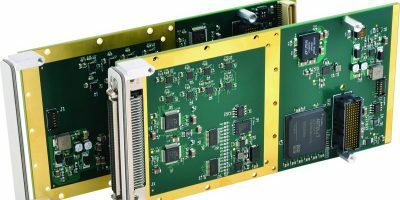 The boards are designed for commercial off-the shelf (COTS) applications providing an abundance of I/O options to save I/O slots. Various carrier cards are available to host up to two XMC730 modules on VPX or PCI Express computer platforms. A conduction-cooled version is also offered. I/O options includes 16 differential or 32 single-ended analogue inputs, eight analogue output channels, 16 bi-directional input/output channels and 32-bit multi-function counter/timers. The DMA transfer support moves data between module memory this frees the CPU from the burden of moving data between module memory and system memory over the PCIe bus. For connectivity with real time software application programs, Acromag offers C libraries for VxWorks, Linux, and Windows DLL Driver software. The libraries provide generic routines (source code included) to handle functions such as read, write and interrupts. Demonstration programs enable the developer to quickly exercise the I/O modules before attaching the routines to the application program. This diagnostic tool can save hours of troubleshooting and debugging, claims Acromag. Founded in 1957, Acromag designs and manufactures embedded computing and I/O solutions including general purpose I/O boards, single-board computers, FPGA modules, embedded computers, COM Express products, mezzanine modules, wiring accessories, and software. Industries served include military, aerospace, manufacturing, transportation, utilities, and scientific research laboratories. The company is headquartered near Detroit, Michigan with a global network of sales representatives and distributors.